Open the app and this is what you see. The first thing to do is set your preferred value for the CoC. You only need to do this once unless you are switching between cameras with different sized sensors. Click the right arrow (indicated here with a blue arrow) and enter the value for your camera. Rather than choose your camera from the menu, I recommend you choose a numeric value for the circle of confusion. To determine the hyperfocal distance for a given lens and aperture (f-stop), on the lower left part of the screen choose the focal length of the lens and the f-stop you want to use. In this example they are f/16 and 24mm. The hyperfocal distance will show up in the middle of the screen (red arrow). In this case it is 5 feet, 2.56 inches (lets just call it 3 inches). Set the distance scale to 5 feet 3 inches and the depth of field shows up in the upper part of the screen. This means if you take a 24mm lens, set the aperture to f/16, and focus the lens at 5 feet three inches, your depth of field (zone of apparent sharpness) is 2 feet 8 inches to infinity (“infinite” in the app). When you are out in the field, find a lens aperture, focal length, and focus distance combination that will give you that amount of depth of field that you want. 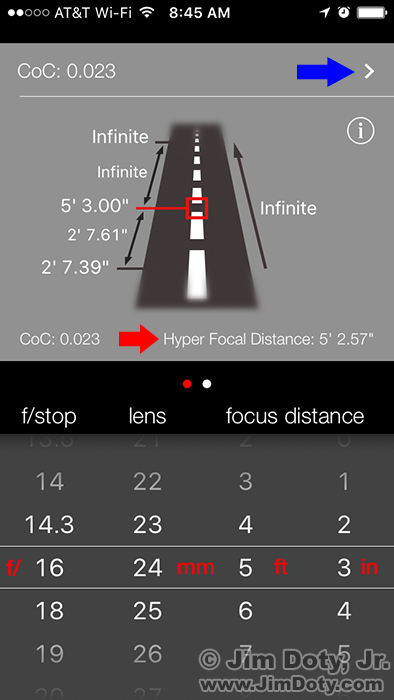 Be sure to set the focus distance on the lens to match the focus distance on the app. You don’t have to go with the hyperfocal distance calculation if you don’t want to. Just ignore the hyperfocal distance calculation (red arrow) in the middle of the screen. Set the lens aperture and lens focal length in the app to the values you will use with your lens, and the focus distance in the app to the distance you will focus your lens at. The upper part of the screen will tell you the near and far limits of depth of field. If you want more or less depth of field, change the settings on the app until you get what you want, then adjust your lens accordingly. Depth of field decreases as you make larger prints. If you want to make really big prints, say 16×24 inches in size, you need to use a smaller lens aperture to get the same depth of field. There are two ways to go about this. The simplest way is to use an aperture one stop smaller on your lens than the one in the app. In the example above use an aperture of f/22 on your lens instead of the f/16 in the app. If the app is set for f/8, set your lens to f/11. If the app is set for f/11, set your lens to f/16. Don’t reset the app to the smaller aperture. 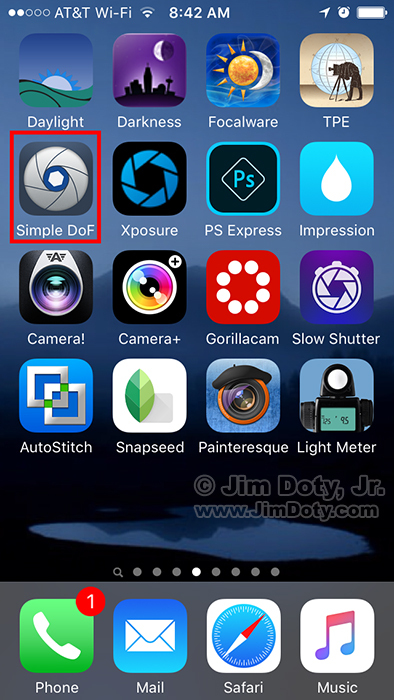 Just use an aperture on your lens that is one stop smaller than the aperture in the app. The other way (which is technically more accurate) is to reset the CoC value on the app. I don’t want to take the time to reset the CoC values when I am out shooting in the field. So I just use the quick and dirty method of using a smaller aperture on my lens than the one on the app. This article is targeted primarily at photographers who understand depth of field and hyperfocal distance charts and how to use them, but are looking for a handy app to use in the field. If you need to know more about depth of field and hyperfocal distance charts, start here. Controlling depth of field is one of your most powerful creative tools as a photographer. The more you know about depth of field the better your photos will be. There are two whole chapters and 40 pages of information devoted to depth of field in my book, Digital Photography Exposure for Dummies. Learn more here and order it here. It is one of the highest rated photography books at Amazon.com. This entry was posted in Computing and Software, General, iPhone Photography, Using Equipment by Jim. Bookmark the permalink.